We are indulged in providing the best of EPC Contracting Services. Thee services are available with us at most reasonable price. Offered services are performed under the guidance of skilled professionals by utilizing premium quality tools& technology. As an affluent name of this domain, we hold expertise in providing Transmission EPC Project. EPC-3 is part of CAIRN energy expansion plan of their existing water injection facilities at MPT. 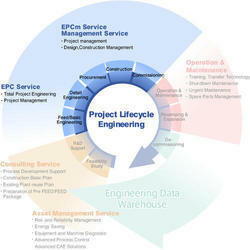 Following is the main process which is involved in the EPC-3 project. KEC is a complete turnkey solutions provider in the Railways Infrastructure EPC space. It is one of the early entrants in the Railway electrification space, having electrified more than 6, 000 kms of Indian Railways. Engineering, Procurement & Construction is our core area of operation. We at EEPL have an enriching experience in the field brought in by the Management having more than combined 50 years of similar experience in various fields of EPC. Backed by massive industry proficiency, we are involved in presenting to our customers’ world class EPC Solar Contractor Service. So as to furnish the detailed demands of our patrons, we spend some time with our clients to understand their needs with a motive to accomplish supreme level of client satisfaction.